I realize I order a lot of books from Amazon. Sometimes in Kindle version, sometimes in book form… I’m still a bit old school and love the feel of holding a book and turning the pages and the smell of a book. While perusing Amazon recently I ordered just such a book — one in which I wanted to be able to turn the pages. 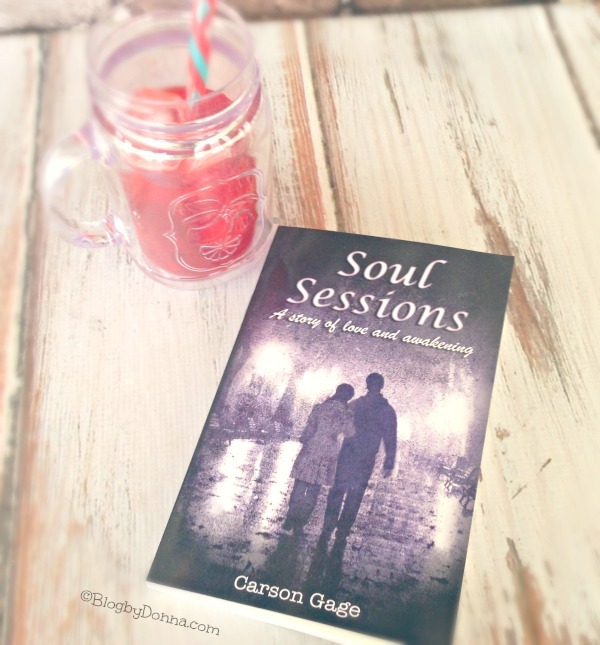 The book was “Soul Sessions” by Carson Gage. I have to say I found myself a bit conflicted while reading Soul Sessions at first. I am a Christian and I don’t believe in reincarnation. I do however, have an open mind. I enjoy reading about different beliefs, religions, and customs. I also enjoy fiction and several different genres of books, including romance, mysteries/thrillers/horror books. As I was reading Soul Sessions I did find myself struggling at first with the reincarnation and past-life regression aspect of the book. To me, reincarnation implies that God made a mistake in designing our souls to live in our bodies. We were made in His image and each soul is unique. For that same soul to come back over and over again in different bodies doesn’t make sense. Besides, scripture doesn’t support it either. I’m not referring to religion anymore in this review, because at the very heart of this book, Soul Sessions is a love story. A story of a man searching for himself and of lost love. A story of self-redemption and a true meaning of love. As I started reading “Soul Sessions” I found myself struggling to like the main character, Nick Dalton. I don’t have to love the protagonist of a book, I’ve had many love-hate relationships with characters of books I’ve read, but I do want to like him or her, though. Even though I didn’t instantly like Nick, I did quickly develop an empathy for him. Almost half way through the book though, I found myself cheering for him. Wanting him to find peace. Wanting him to find love. I fell in love with Nick. An overwhelming question I was left pondering was, “Does everyone have a soul mate?” Is there someone out there that each of us should be with, someone just for YOU? I have met people and immediately felt like I’d known them my whole life (one of my best friends was exactly like that)… instantly comfortable with her. I know I felt a deep connection with my husband when I first met him. I knew very early in our relationship that he was the ONE. I’ve wondered, “What if I had not gone on that blind date that night in February of 1991?” Would I be in a miserable place now because I had not met MY soul mate? Carson Gage has been interested in the mysteries of life and death since the age of seven, when he survived being run over by a speeding car. This experience led him on a journey of discovery for answers to some of life’s biggest questions. Do we have multiple lives? 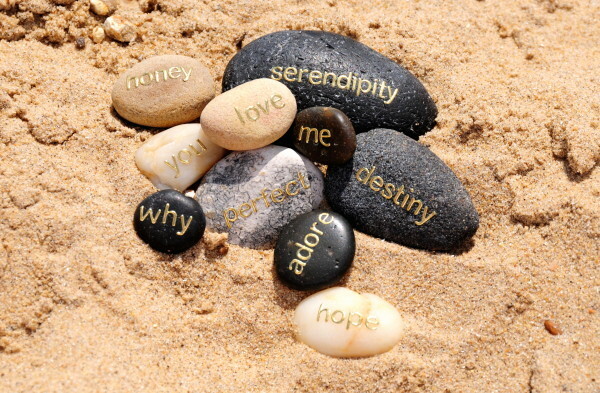 How does synchronicity (serendipity) affect our lives? 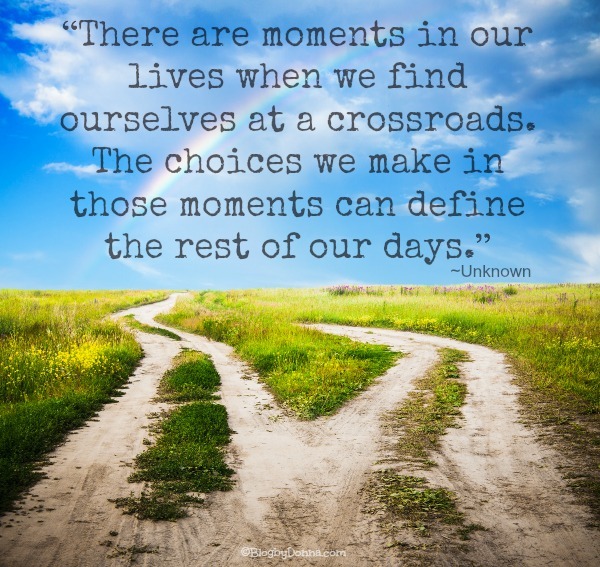 Do we have a pre-life plan and how does it co-exist with our free will? 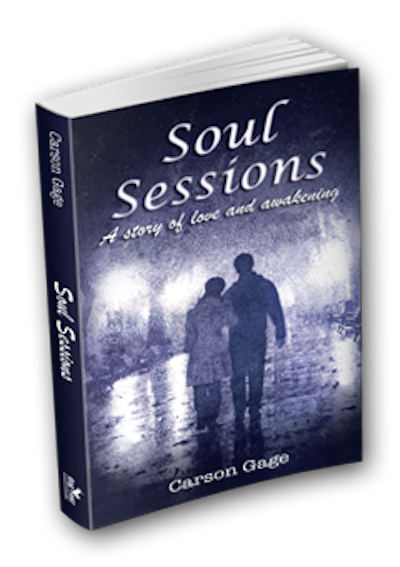 I highly recommend reading Soul Sessions — it is a roller coaster ride of emotions, makes you think, and leaves you wanting more. Thanks for such an honest review. I’ve picked up many books based on reviews and been disappointed because the review was a little overblown. This sounds like a wonderful book. I’ve always found books about how choices shape our lives to be very interesting. I do believe everyone has a soul mate, sadly I think many do not meet that one though. For those who have or do, I admire reading about their experiences but I seriously believe we all have a soul mate out there even if we never, ever meet them. I’ve read several reviews of this book now. It sounds like something I would really love to read. What a cool concept for a romance novel. It’s really cool that over the course of the book, you became fond of Nick! Thanks for the honest review. This sounds like SUCH an interesting book, and it can be looked at from so many perspectives. I don’t know if we have a soul mate, and I’m not sure what to believe as far as reincarnation goes. It’s all such a confusing mess sometimes! I believe I found my soul mate. I don’t believe in reincarnation either. However, I can enjoy a good story anyway. Sounds really interesting! That sounds like a great read. I am adding this to my reading list. I think we have soul mates. Hope that everyone is able to find theirs. I could not imagine meeting a person more perfect for me than my husband, nor could I picture spending my life with anyone else. I definitely feel as if I found my soul mate! Sounds like a good one. I will check it out. This sounds like a really interesting book. I may have to check this one out in the near future. I believe everyone has a soul mate. I know I found mine, though not everyone is so lucky. I’m glad you ended up cheering on the main character during his search. I’ll be looking for Soul Sessions. It sounds like a great read, and one that will make you think. I don’t believe in reincarnation, but it sounds like it gives the love story another dimension. Looks really interesting to read. Thank you for an honest review… I don’t believe in reincarnation, and I don’t think I would have considered this book, but after reading this, I will check it out! Sounds like a very interesting book. Personally I don’t believe in reincarnation either, but not for religious reasons… I don’t really believe in soul-mates either, but I do like a good love story. I might have to check this book out. This does sound like a good read. I do not believe in reincarnation because the bible doesn’t support it as you said however I can still enjoy a book. I read one time, along with the topic does everyone have a soul mate, that in our lives we can meet Mr/Mrs Right and not treat them very well or as the Right one for us and it will not work out very well or we can meet Mr/Mrs Wrong and treat them as if they are the Right one and it will work out beautifully. Just a thought. When I start thinking about predestination, as some believe, and our God given free will I get all confused myself so I usually just keep in Simple and straight forward in my beliefs of the Bible but still can enjoy the book. It does sound intriguing. I will have to read. Christy, yeah, I have my beliefs and reading a book about, say, reincarnation, doesn’t waver that belief. As I said, this book is a beautiful love story and I do believe it is worth the read! I love conversations about soul mates. There are so many different opinions about what that actually means and how many one can have. So far I haven’t heard any bad arguments. I bet this book would be a great book club option. Yes, Tonia, this would be a great book club selection! I am not sure I believe in soul mates. But it sounds like an interesting novel. This is a great review! I have heard some great things about this book and think I owned enjoy this! I shall check it out! This sounds like my kind of book. I do believe in soul mates, I married mine 11 years ago! This looks like a wonderful book to read. I will have to pick up a copy the next time i am at the book store. This sounds like an interesting read. I definitely believe in soul mates, I just haven’t found mine yet. Thanks for the honest review. This looks like a great book. I do believe we all have soul mates for sure. That was a really awesome review. I loved that you opened your mind and continued to read. I often feel we should not let our beliefs, no matter what they may be, keep us from exploring. There is a whole world out there ready for us to seek it out. I believe in soul mates, but that’s because I’ve found mine. A soul mate is a hard concept to grasp until you experience it for yourself. Love this review! I think I need to grab this one to read at some point and share with friends. Thanks for the honest review. I’m not sure this is a book I would pick up but before judging that I love reading book reviews. I appreciate this one and of course I think we have a soul mate. I love the quote! Thanks for sharing your review of this book! This sounds great. I would love to read it. This sounds like a great book to read. I believe in soulmates. I do believe in soul mates. Thanks for this review! I used to believe that there is one perfect person for everyone. But, since I am 40 and single, I’m starting to see things differently. You may find someone that you have a lot in common with…and maybe there are more than 1 person…then, you just work at getting along with each other for the rest of the time that you are together!!! Thanks for the review of Soul Sessions! It sounds interesting…and I believe that members of my family, that have passed, are looking out for me…but, am otherwise an atheist. I am not adverse to others believing in whatever they believe, just don’t try to talk me into your vision. I believe that certain people belong together, but you have to work at any relationship! I like the idea of a book that makes you think. One that makes ya think outside the box. Reincarnation, soul mates, etc… sounds like very thought provoking topics. Thank you for the great review. There are lots of things to think about in this book. Oooh this sounds like a great read too!! I try not to take fiction books too seriously so thankfully my religious beliefs wont affect my thoughts on it!! Can’t wait to pick it up now!! You make this book sound like a must read! I wish I could find more time to read (I already have a long queue that I’m working on). Thanks for the post – it sounds like a really rollercoaster ride!